His disciples asked him why he teaches in parables. But he said, "for you; you already have the privilege to understand the word that comes from the living God". It is given to you as a privilege free of charge so that you may share it to your brothers and sister without price. But the eyes of their heart is blinded by the devil. Their ears are completely shut off so that they could not realize that I am their healer and they cannot understand simply what I am going to tell them. As little children, I will tell them with little story’s and parable so they will never forget my teachings. This is the wisdom of the Lord that many have used it to teach younger generation. 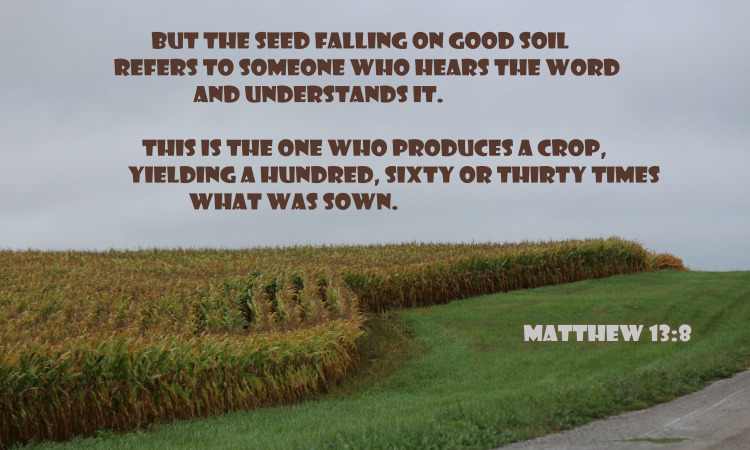 The parable of the sower is one of this kind. As Christian we may hear the word of God not once or twice but many times previously. We have read the word of God delightfully. We will see what are the steps we need to take to be fruitful to the Lord as Jesus mentioned it here. ... When anyone hears the message about the kingdom and does not understand it, the evil one comes and snatches away what was sown in their heart. This is the seed sown along the path. Since there is no wisdom and understanding and the fear of the Lord, the word that spoke to them doesn't make any sense to them. It has no value compared to other staff in the world. When they go about their life, everything will be all forgotten. The devil is expert in taking what God has planted. Wisdom and understanding comes from the Lord. The word of God is not something we listen to it for fun and forget about it. It needs mediation and deep understanding. There is one thing that can effectively change christians in to the likeness of God through Jesus and that is to be planted in the word of God with diligence. The second step is to have deep root in Christ through the word of God and the Holy Ghost. The seed falling on rocky ground refers to someone who hears the word and at once receives it with joy. But since they have no root, they last only a short time. When trouble or persecution comes because of the word, they quickly fall away. This kind of people are basically are those Christians who believe in Jesus and take a great delight in hearing the word of God. They are no the ones who just simply forgets what the Lord said. Like St. Peter was tested and failed first, second and third time, these type of Christians do not build their faith on the foundation of pure love and relationship with Christ. They might be passionate to follow Christ when there is abundance of food and blessings in their homes. They are passionate to serve him when things look great. But when persecution and hard times knocks at the door, they will simply lose it. They would not sacrifice themselves for the sake of the gospel! Daniel 3:18: But even if he does not, we want you to know, your majesty, that we will not serve your gods or worship the image of gold you have set up." We cannot appreciate the good times of our lives unless we really understand what it looks like to be alone and with no help at all. Peter was relying in self-confidence rather than putting his trust on the Lord. Having deep root in the word of God and diligently seeking the face of God help us skip the bad days that the devil has plan to destroy us. This is where willfully engage in a dangerous way of life style that can potentially consumes our spiritual growth towards our God through Christ Jesus. Here things become apparently so important for us that we give away our precious time, energy and resources to potentially harmful habits to gain fame and prosperity without the will of God for us. The world knows how to get the best of us taking away the special part of our lives that was supposed to be sacrificed for the Lord. Here I am not trying to degrade the value of hard work to offer our best in the areas where the Lord has placed us. I want to be sure that the Lord wants you to use your talents and be fruitful wherever he has placed you. The Lord put you there for a reason and he wants to make you available for the good work he wants to do in people’s lives. When we practice these things, we will yield hundred and we would be able to accomplish his will in our lives. May God bless you abundantly for reading this blog..